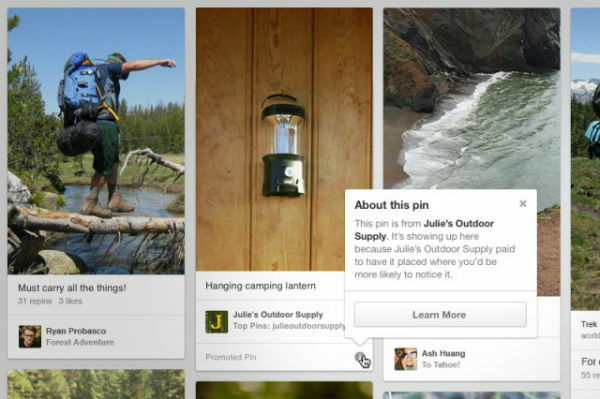 The two largest image based social networks are rolling out new ad products. It’s big news for socially inclined advertisers. The bad news is that both platforms are rolling out slowly with “select” brands first. Those with big pockets get to play first. But that doesn’t mean you shouldn’t be ready to jump when the time is right. Mobile will reach nearly 10 billion in ad revenue this year. With those kinds of advertising dollars on the line you can bet each platform will have a strong mobile focused product available. Both Instagram and Pinterest are known for the integrity of their content. The power users of each platform seem a bit upset about ads coming to their fave social networks. Because of that both social networks seemed focused on delivering a nearly invisible ad product. Check out this Pinterest ad. It’s hardly noticeable minus the promoted pin tag. The bullet says it all. The ad above was shown after a keyword search on Pinterest. You can see it fits contextually perfectly with the surrounding pins. Seamless integration. So seamless affiliates may need to think about how to adjust their “look at me” based advertising methods in exchange for something a bit more subtle. It appears as though Instagram ads will appear to users based on demographics as opposed to brands followed or interests stated. The lack of psychographic targeting that’s become so valuable with networks like Facebook may prove to be a misstep in time. Perhaps the engagement level of Instagram proves to be the ROI influencer advertisers are hoping for. We’ll see. Just like every new advertising opportunity that pops up it’ll take time to find what works. The seamless integration may provide some unique challenges. Reading over the terms of both platforms carefully will most likely lead you to “aha” moments in this regard. That and of course… testing. Are you excited about the new advertising opportunities on these sites? Have any ideas of how you’re going to take these one? Let us know in the comments below. What the heck is Micro Content and How do you leverage it? Snapchat rolls out its first ad campaign – Is it way too creepy?